The Marine Corps handles advancement based on its needs. Making advanced ranks in the Marines goes strictly by the numbers needed in the higher ranks. In the Marines, an E-4 (Corporal) has to earn his stripes and added responsibility, however, the promotions to the ranks of E-2 and E-3 are pretty automatic, barring any serious offense. Promotions to E-4 and above are competitive and are based on specific vacancies within the Marine Corps’ jobs. The Marine Corps takes the number of slots it has for each enlisted rank above the rank of E-3 and allocates them to the different enlisted jobs. In order to promote someone above the rank of E-3, there must be a vacancy. For example, if an E-9 retires in a certain military occupational specialty (or MOS, what the Marines call their jobs), that means that one E-8 can be promoted to E-9, and that opens an E-8 slot, so one E-7 can be promoted to E-8, and so forth. E-2, Private First Class, PFC. E-8. Master Sergeant, MSgt. First Sergeant, 1Sgt. Under decentralized promotion system, the unit, or company, is the promotion authority. In theory, the commander decides who gets promoted and who doesn't. In actuality, because there are no quotas for promotion for E-2s and E-3s, commanders pretty much promote everyone who meets the criteria, barring any egregious violations. The promotion criteria are set by the to ensure that the promotion flow remains stable, and everyone (regardless of MOS) can expect to be promoted in the same (approximate) time-frame. The promotions to are competitive. That means there are only so many "vacancies" in each grade (above E-3) in each MOS (job). Master Sergeants and First Sergeants in the Marine Corps are paid the same (both are E-8s). However, the First Sergeant has a much larger degree of authority and responsibility. The First Sergeant wears special rank (with a diamond) and is the top enlisted leader in the unit. First sergeants work directly for the unit commander and are responsible for the morale, welfare, and discipline of all of the enlisted members assigned to the unit. When you are an E-7 Gunnery Sergeant you will indicate on your proficiency reports whether you wish to be considered for promotion as a Master Sergeant or as a First Sergeant. Successful completion of , Recruiter or Marine Security Guard school in the grades of corporal through gunnery sergeant can replace the requirement to complete resident PME courses, including the SNCO Advanced Resident course, provided the Marine has also completed the appropriate nonresident program. The Marine Corps Promotion Board takes all the selectees (without regard to MOS), and gives them a promotion sequence number, which is assigned according to seniority. For example, if it's the E-7 list, the Marines will give the lowest sequence number (0001) to the E-7 selected with the most time-in-grade as an E-6. Each month, for the next 12 months, the Marines will then release the sequence numbers of those to be promoted during that month. This ensures a smooth promotion flow for the following 12 months when the next board will meet and do everything all over again. 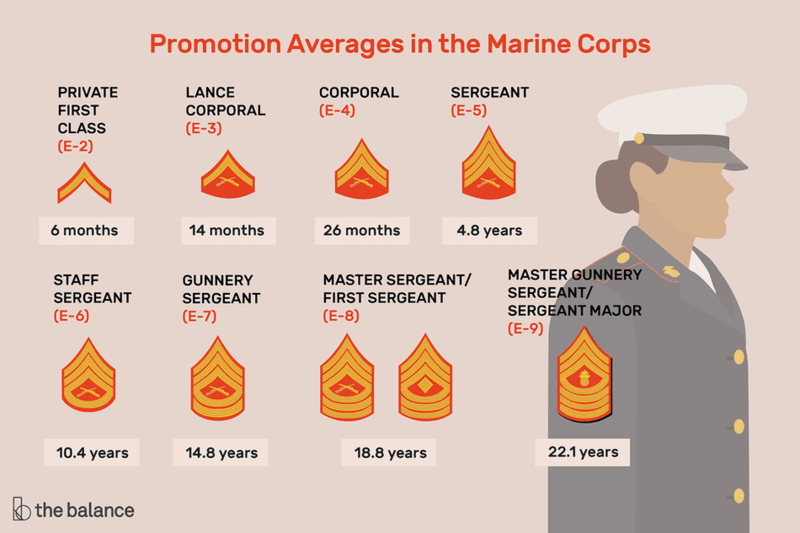 In addition to the normal promotion system and below-the-zone early promotions, commanders can promote a very few, outstanding Marines via the Meritorious Promotion System. Marines can be promoted up to the rank of E-8 under this system. Promotions to the rank of First Sergeant (E-8), however, cannot be made by meritorious promotion. Additionally, meritorious promotions to (E-8) are limited to Marines in the Drill Instructor and Recruiter of the Year Programs. Meritorious promotions are not used as rewards or when a personal commendation/award is appropriate. A meritorious promotion is based entirely on the Marine’s demonstrated capability to discharge the responsibilities and duties of the higher grade in a satisfactory manner. Commanding generals may award combat meritorious promotions to Private First Class (E-2) through Sergeant (E-5) in numbers that do not exceed the quarterly meritorious promotion allocations established by the Office. In the cases of Sergeants (E-5) and Staff Sergeants (E-6), commanding generals make recommendations to the Commandant's office who approve or disapprove the recommendations for combat meritorious promotion based on meritorious action and performance in combat or performance under combat conditions. Determination of eligibility for promotion will be based on the command’s recommendation, combat performance, and past military record.